North Korea launches ICBM and says it can hit anywhere: What will Donald Trump do? BEIJING — North Korea said it has successfully carried out the launch of an intercontinental ballistic missile, a crucial milestone in Pyongyang’s efforts to develop its nuclear weapons capability, despite repeated international warnings to the contrary. The missile, which was launched from an airport near China’s northeastern border with North Korea, landed in Japan’s special economic zone, sending shockwaves through Tokyo’s political establishment and confirming Beijing’s inability to keep Pyongyang in check. On Tuesday, Japan’s Prime Minister Shinzo Abe said the latest missile test shows the North Korean threat has increased. David Wright, a physicist and co-director of the Union of Concerned Scientists said in a blog online that if reports are correct, the same missile could have a maximum range of roughly 6,700 km on a standard trajectory. The North’s possession of a working ICBM – something that Trump has vowed “won’t happen” – would force a fundamental recalculation of the strategic threat posed by the isolated, impoverished state. The “landmark” test of a Hwasong-14 missile was overseen by leader Kim Jong-Un, an emotional female announcer said on state Korean Central Television. 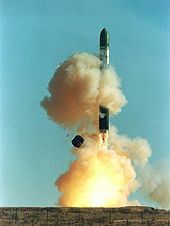 The rocket was “a very powerful ICBM that can strike any place in the world”, the announcer said, and “a major breakthrough in the history of our republic”. In a statement the North’s Academy of Defence Science, which developed the missile, said it reached an altitude of 2,802 kilometres and flew 933 kilometres, calling it the “final gate to rounding off the state nuclear force”. There are still doubts whether the North can miniaturise a nuclear weapon sufficiently to fit it onto a missile nose cone, or if it has mastered the technology needed for it to survive the difficult re-entry into the Earth’s atmosphere. US President Donald Trump would prefer that Japan and China handle this, but may well decided to take military action. A Chinese spokesman today indicated that China prefers more economic sanctions for this (see https://www.voanews.com/a/north-korea-missile-test-puts-china-on-the-spot-/3927490.html). “It’s a major threshold … a really difficult question will be whether Donald Trump feels like he’s (been) backed into a corner and doesn’t have options short of war,” he said. “I think what we’ll have to grapple with in Washington is that none of our tactics or our levers mean the same thing anymore,” Mount added. On Tuesday, North Korea announced on state television it had successfully tested an intercontinental ballistic missile (ICBM) for the first time — something which has long been seen as a red line in already fraught bilateral relations. Euan Graham, director of the International Security Program at Sydney’s Lowy Institute described the development as a foreign policy failure for the United States, going as far back as the Clinton administration. “It’s a failure that goes beyond any one (US) administration,” he said. “An ICBM actually takes the threat (of North Korea) right to the US homeland … that’s the dangerous dynamic that will be a driver for how the US responds,” Graham said. In January… Donald Trump responded on Twitter, saying North Korea would not be allowed to create a nuclear weapon capable of hitting the US. “North Korea just started that it is in the final stages of developing a nuclear weapon capable of reaching parts of the US. It won’t happen!” he said at the time. In April, at a celebration of North Korea’s “Day of the Sun,” a missile was paraded through the capital Pyongyang which one analysts said could have been a type of ICBM. “The US failed to prevent the North Koreans from reprocessing their nuclear material, they failed to prevent them from testing nuclear missiles and now we’re at the threshold where the North Koreans has not just a basic missile but seven different types and all surprisingly sophisticated,” said Graham. Donald Trump may decide he has to somehow hit at North Korea to show that he is not just all talk. It is likely that North Korea picked the 4th of July (a US holiday) on purpose to pretend to show that it does not fear the USA. North Korean politicians have often been playing a dangerous game with their country and their people, and hopefully they will realize, sooner than later, that a military conflict is not in their interests. This entry was posted on Tuesday, July 4th, 2017 at 7:30 am	and is filed under Prophecy.